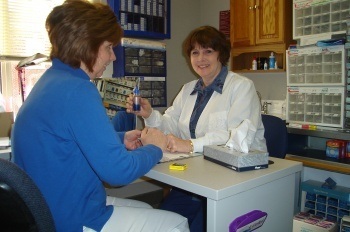 Joy has been employed by Carty Eye Associates for the past 19 years. Her department works closely with our Doctors to make sure our patients are fitted with lenses that are comfortable and give them the best vision. If you are new to wearing contacts, our technicians will make sure you are trained in the insertion and removal of the lenses, as well as the proper care and handling of contacts. We specialize in the fitting of both gas permeable lenses and soft disposable lenses. We accept many vision insurances and will help determine what they will pay toward your contact purchase. There are rebate forms available for all the major Contact Lens Companies. For your convenience, we will be happy to ship your lenses directly to your home. We are open 7 days a week!